This recipe comes out of a handwritten cookbook of my grandma’s recipes. I received a copy of her her favorite recipes including her Oatmeal Fudge Bars. I love this cookbook and everytime I make a recipe from it I picture my grandma in her kitchen (with two stoves/ovens) baking bread and goodies each day. I loved to help her and can’t wait until I have children and grandchildren to create memories with them and share my passion for cooking and baking. 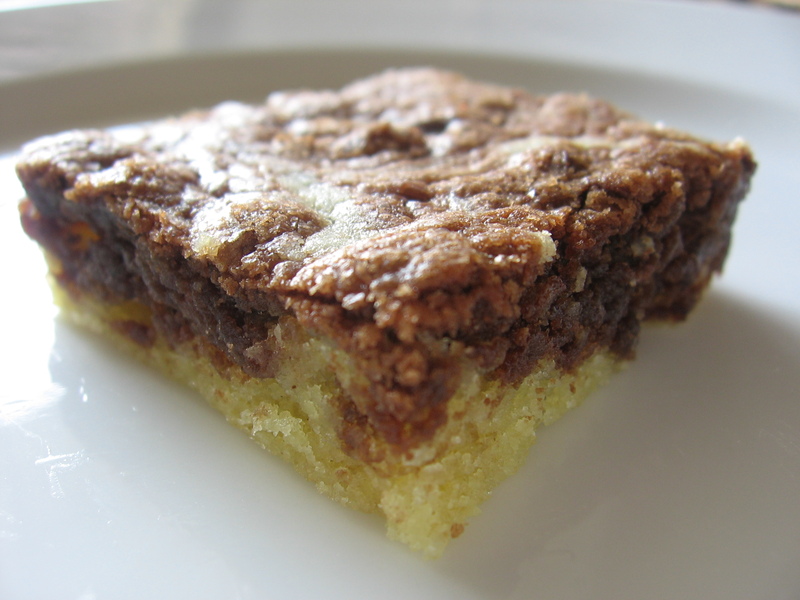 These bars a cross between cake and a brownie. They are not as light and fluffy as cake but don’t have that true uber chocolate flavor like a brownie would (even cake-like brownies). I made these for movie night with some friends. I wanted something chocolately but not overly so or too rich. I also wanted something that we could eat with our hands and not need a bowl and fork/spoon. I had recently made cupcakes and was not in the mood to make them again. I wanted a bar recipe but after paging through my cookbooks I did not find one that jumped out at me. That is when I reached for my grandma’s cookbook and the title caught my eye. That was exactly what I was looking for! These bars have a more dense texture than cake but in a good way. I like the fact that they incorporate chocolate into the batter without it dominating the overall flavor of the bar. It is like a marbled cake but in bar form. The batter was very thick and I had a difficult time ‘swirling’ the two together. I swirled very little for fear of mixing the two batter together making the two distinct colors merge into a lightly colored cake bar. These were eaten up by my friends in no time, even by the non-sweet eaters. I will admit that we did eat a few after the movie with a scoop of icecream, hot fudge and toasted walnuts on top. I have to say that I loved the texture of these bars with the icecream and hot fudge better than a cookie. I would make these again. Next time I might add mini chocolate chips or toasted walnuts (as called for in the recipe) to the batter. My swirling technique was not the best with these bars because the batter was thick. Next time I think I will swirl more than I did this time, for appearance sake. Either way, these are worth a try and are easy to modify to your family’s preferences (toasted nuts, M&M’s, chocolate chips, PB chips, toasted coconut etc.) These would even be good frosted! Lightly spray and flour a 9×13 pan with PAM. In a small bowl wisk together the flour, baking powder and salt. In large mixing bowl cream the shortening and sugar. Add the vanilla and eggs. Beat only to combine. Mix in the flour mixture and beat at medium speed for 2 minutes. Spoon half the batter into another bowl. Fold the 1/2 cup of nuts into the vanilla batter. Gently pour batter into prepared pan. To the remaining batter fold in the melted chocolate until incorporated. Gently drop spoonfulls of the chocolate batter over the vanilla batter in the pan. Using a greased knife, cut through the two batter to create swirl patter. Top with remaining nuts. Bake for 20-30 minutes or until a toothpick in the center comes out clean. Do not overbake. *Mine baked in 24 minutes. These bars are very good, messy, but good! I got the recipe out of an old church cookbook and couldn’t wait to try them because they combine the goodness of a S’more: graham crackers, chocolate and marshmallows in an ooey gooey bar. Another reason these bars caught my eye is that they do not require any bake time! Perfect for summer days when you don’t want to use your oven but still want a tastey sweet! These were a breeze to make and so good that I was eating them out of the pan with a spoon before they were cool. After cooling some they were easier to cut and serve, however, they did crumble a bit but the taste makes up for the mess factor in my opinion! I am not sure how long these would stay fresh and chewy because I took them to work and they were gone in minutes. Line an 8×8 pan with foil and spray with PAM. In a medium mixing bowl combine the graham cracker crumbs, 3/4 cup marshmallows and 1/2 cup chocolate chips. Set aside. In a medium sauce pan over medium heat, combine the egg, butter, sugar and vanilla. Cook, stirring constantly until it comes to a full boil. Remove from heat and allow to cool slightly. Pour mixture in bowl with the graham crackers, marshmallows and chcolate chips. Stir to combine. (Marshmallows and chips will melt a bit). Fold in remaining marshmallows and chips. Cool until set. Remove foil and bars from pan, cut and serve. Store in airtight container either room temp or in fridge (if during warm months). While I am a HUGE chocolate cake lover, my heart belongs to the Yellow Cake. I tried my hand at making one from scratch and was very pleased with the results. After searching through several cookbooks for a recipe that was worthy of sacraficing my Homemade Yellow Cake Virginity I decided I was more comfortable using a recipe already blogged about for my “first time”. I turned to Nic at bakingbites and found what I was looking for! I followed her recipe to a “T” with the exception of adding a drop of Yellow food coloring to bump up the Yellow in my Yellow Cake. Take note, as she uses a unique mixing method (blends the butter with dry ingredients before adding the wet) which produces a cake that has the most tender crumb you have eaten. The cake baked up light, fluffy and oh so delicious. and nothing takes a Yellow Cake over-the-top better than Chocolate Frosting. I was so pleased with the cake that could not wait to taste it. Instead of making homemade chocolate frosting, I busted out my favorite canister of Chocolate Frosting and proceeded to enjoy the fruits of my labor with a good slathering of Chocolate on top (just the way I like it). Let me say, while boxed Yellow cake mixes totally rock my world, this recipe has sent my world into a tail-spin! Line a 9×13 inch sheet pan with parchment paper, or lightly grease it with shortening or oil (butter will produce a harder “crust”). Sift cake flour, baking powder and salt into the bowl of an electric mixer. Add sugar and, using the paddle attachment, mix on low speed to blend. Cut butter into 4 or 5 chunks and drop into the bowl with the flour. Blend on low speed until mixture looks sandy and no large chunks of butter remain, 1-2 minutes. In a large measuring cup, combine eggs, milk, vanilla and food coloring. Beat lightly with a fork until combined. With the mixer on low, pour 1 cup of the egg mixture into the bowl. Turn speed up to medium and beat for 1 ½ minutes. Reduce speed back to low and pour in the rest of the egg mixture. Continue to beat at low speed for an additional 30 seconds, until liquid is fully incorporated. Scrape down the sides of the bowl and beat for a few more seconds, if necessary.Pour into prepared 9×13 pan and spread batter evenly with a spatula. Tap gently a few times to eliminate any bubbles. Bake at 350F for 30-35 minutes, until a tooth pick inserted into the center comes out clean.Let cool for 30 minutes in the pan before turning out onto a rack to cool completely. Frost with Chocolate Frosting and Enjoy! These cookies remind me of something Paula Dean would make (1 1/2 cups of butter!!!) Yowza! Also, these cookies use few ingredients (NO eggs needed!) and are a snap to whip up! The finished product is light and butter and slightly sweet. The texture of these cookies is not cake-like but somewhat “flakey”. They definately melt in your mouth! I think the mini-chips are perfect in this recipe (or omit all together). Regular size chips would overpower this little gem and I am not sure the cookie has the sturdiness to handle full size chocolate chips without crumbling. Plus, the minis are soooo cute! These would be so cute on a Christmas goodie platter sprinkled with powdered sugar or green/red granualted sugar! In a mixing bowl, beat the butter until smooth. Add sugar and vanilla and beat until creamy. Mix in the flour and salt until combined. Gently fold in the chocolate chips and nuts by hand just until combined.Form dough into balls using medium scoop and place on parchement lined baking sheets. (At this point I chilled and then transferred to tupperware containers to freeze once the balls had set. ) *I would recommend chilling balls for a few minutes before baking to prevent overspreading. Bake on parchment lined baking sheets for 9-12 minutes or until lightly browned. Sift powdered sugar over cookies directly out of oven or sprinkle with colored sugar. Cool on baking sheet for 5 minutes and then transfer to a cooling rack to cool completely. Before serving, sprinkle with additional sugars if desired. Wow, August is almost over, I can NOT believe it! Pretty soon Christmas will be right around the corner. Well, this weekend I baked up a tasty little cookie that reminds me of the Christmas cookies my mom always bakes. I didn’t take a picture but let me tell you these need to go in your holiday rotation! They are chocolatey, pepperminty, and oh so sweet (even if you have not been). The real key here is a good quality cocoa powder. I LOVE Ghiradelli chocolate. I like Hershey’s cocoa as much as the next gal (HELLO Perfectly Chocolate Cake and Frosting) but these cookies really deserve some high quality cocoa. These cookies are sweet (may be too sweet for some: (cough, chickens!! cough)) so rolling them in sugar before baking is optional. However, doing so will produce the most glorious sugar crusted, crackly topped chocolate peppermint piece of heaven you have ever had the pleasure to indulge in. *Can be easily doubled, I got about 14 cookies, just enough to eat some a freeze some. Preheat oven to 350.Line baking sheet with Parchement paper. In medium bowl whisk together the flour, cocoa powder, soda, baking powder and salt. Set asideCream the butter and Crisco. Add the sugar and beat until blended. Add egg and peppermint extract, beat until well combined. Fold in with a spatula the flour/cocoa mixture. Mix with a blender 10 seconds to combine. Fold in the white chocolate chips and Andes chips. Using a medium cookie scoop form dough into 1-inch balls. Roll each dough ball in a cup of sugar to lightly coat. Place 2 inches apart on prepared baking sheets. Bake for 9-10 minutes or until edges are firm and the center appears slighlty soft, don’t overbake. Cool on baking sheet 3-5 minutes. Transfer cookies to racks and cool completely.